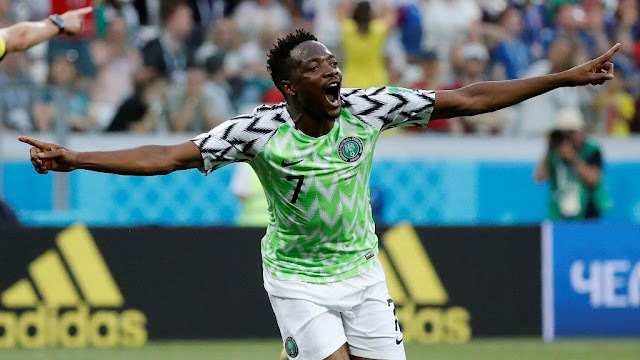 Nigerian forward Ahmed Musa is in the race for the best goal at the 2018 FIFA World Cup hosted by Russia. His goal has been shortlisted along with the likes of Ronaldo, Messi and Modric. The player’s second goal in Nigeria’s victory against Iceland in the group stages joins seventeen other contenders in a contest to pick which one is the best. It is the last individual accolade to be presented by the football governing body having already named the best player (Luka Modric, Croatia), best young player (Kylian Mbappe, France), top goalscorer (Harry Kane, England), top goalkeeper (Thibaut Curtois) and Fair play team of the tourney (Spain). It is also a contest that is open to public voting. “Here is your chance to vote for the 2018 FIFAWorld Cup Russia Goal of the Tournament, presented by Hyundai. “Choose below from our shortlist of the best 18 goals at Russia 2018 and cast your vote. Voting will remain open until Monday 23 July, so don’t miss this opportunity to pick your favourite!” FIFA wrote on their website.